Oregon’s Coast Range is known for its dramatic scenery. It is also extremely diverse, with habitats ranging from open sandy dunes to lush forests and from tidepools to headwater streams. The Coast Range ecoregion includes the entire reach of the Oregon coastline and extends east through coastal forests to the border of the Willamette Valley and Klamath Mountains ecoregions. In general, the topography is characterized by steep mountain slopes and sharp ridges. Elevation varies from the ocean shoreline to Marys Peak, which is about 4,100 feet high; however, main ridge summits are approximately 1,400-2,500 feet. The Coast Range ecoregion is bordered by the Nearshore ecoregion on the ocean shores and intersects it in Oregon’s estuaries. The Coast Range’s climate is influenced by cool, moist air from the ocean, and is the wettest and mildest in the state. The ecoregion’s mild, moist climate creates conditions for highly productive temperate rainforests, which are important ecologically and for local economies. Most of the ecoregion is dominated by coniferous forests. Large forest fires are very infrequent but are severe when they occur. For example, the Tillamook Burn, which is actually a series of wildfires that occurred from 1939-1951, burned approximately 350,000 acres. The Coast Range includes the highest density of streams found in the state, and deciduous riparian vegetation is distinct from surrounding coniferous forests. Along the coastal strip, habitats are influenced by the marine environment and include beaches, estuaries, and headlands. Some towns in Oregon’s Coast Range ecoregion include: Tillamook, Yachats, Astoria, Bandon, Cannon Beach, Elkton, Florence, Gold Beach, Lincoln City, Newport, and Waldport. The largest urban area on the coast is in Coos Bay/North Bend. Because of the bay and the Coos River, this area is a hub for fishing, shellfish, forest products, and transportation. Forestry remains the primary industry in the interior portion of the ecoregion. The Oregon coast offers excellent recreational opportunities, and tourism is important to local communities. Fishing, both commercial and recreational, and fish processing are significant components of the economy. People are increasingly moving to the coast to retire, so retirement services are growing in importance to coastal communities. Demand for waterfront property is increasing, along with numbers of people recreating, relocating, and retiring along the Oregon coast. Careful resource planning helps to balance these increasing demands with maintaining coastal fish, wildlife, and habitats. Coordinated, broad-scale planning is especially important given the diversity of the Coast Range ecoregion. For example, the Northwest Forest Plan covers much of the region’s forests. However, the adaptive management component of the Northwest Forest Plan has not been fully implemented. Although many plans currently exist, there is a continuing need to consider the unique requirements of transitional zones such as estuaries, and to integrate marine and inland conservation planning. Much of the ecoregion is publicly owned and managed to balance recreation, tourism, and conservation. However, ownership in the northern part of the ecoregion is particularly fragmented. Restoration of watershed processes and functions, and restoration of habitat complexity (e.g., woody debris) to stream and riparian areas, are major concerns throughout the entire Coast Range ecoregion. Restoring flows to headwater streams maintains ecological connections important for many species. Key Conservation Issues of particular concern in the Coast Range ecoregion include Land Use Changes and Invasive Species. In addition to the statewide issues, oil spills, loss of estuarine habitat, and recreational use are of particular concern in this ecoregion. Photo Credit: Oregon Coastal Management Program. The Siuslaw River Estuary in Oregon’s Coast Range ecoregion. Some areas of the Coast Range are developing rapidly, especially along the coastline. Steep slopes limit the amount of land available for development, and concentrate it in sensitive areas, such as near rivers and estuaries. Residential development contributes to habitat loss and can threaten traditional land uses, such as agriculture and forestry. Work with community leaders and agency partners to encourage planned, efficient growth. Support existing land use regulations to preserve farmland and forestland, open spaces, recreation areas, wildlife refuges, and natural habitats. Provide outreach about the benefits of wetland and tideland restoration. Oil spills along the coast can have devastating effects on coastal habitat, fish, and wildlife. Tidal flux can spread oil or other hazardous materials around sensitive habitats very quickly. Therefore, rapid response in the event of a spill is essential. Additionally, spills of hazardous materials or oil from vehicles traveling on roads along the coast could potentially impact nearby rivers and aquatic species. Ensure rapid response and preparedness for spills of hazardous substances. Oregon Department of Environmental Quality’s (DEQ) Marine Oil Spill Prevention Program and the Pacific States/British Columbia Oil Spill Task Force work with multiple parties and interested partners to address these concerns and quickly identify appropriate actions. Coastal rivers, wetlands, and estuaries were altered long ago when side channels were diked, marshes drained, and channels deepened. These changes impacted fish and wildlife dependent on estuarine habitats. Where possible, remove dikes and tide gates to restore estuarine habitats. Where tide gates need to be retained, replace older gates with new innovations, such as side-hinged and aluminum gates that improve fish passage and hydrologic functions. Photo Credit: USFS. ATV riding in the dunes of the Siuslaw National Forest. Recreation contributes positively to the Coast Range’s economy and local communities and is managed carefully in many areas. However, increasing numbers of recreationists can impact sensitive areas, such as shorebird nesting areas and tidepool habitats. There are concerns with off-leash dogs and uncontrolled OHV use in some areas. OHV use and target shooting recreation are increasing on public forestlands, especially just outside of major metropolitan areas. As more land is closed to the public during fire seasons, remaining lands (particularly public lands) are experiencing greater use. Work with state and federal forest management agencies to plan recreational use and to increase education and outreach for recreationists and associated businesses. Where needed, direct activities to particular seasons or away from sensitive areas. 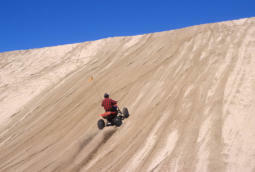 Monitor to ensure that OHV rules for use and public lands motor vehicle use maps are enforced by the managing agencies. Improve public awareness of sensitive areas through signage and kiosks. Non-native plant and animal invasions disrupt native communities, diminish populations of at-risk native species, and threaten the economic productivity of resource lands and waters. Emphasize prevention, risk assessment, early detection, and quick control to prevent new invasive species from becoming fully established. Prioritize management and control efforts to focus on key invasive species in high priority areas, particularly where Strategy Habitats and Strategy Species occur. Where needed, use multiple site-appropriate tools (e.g., mechanical, chemical, and biological) to control the most damaging invasive species. Work with partners to implement measures to prevent unintentional introduction of non-native species (e.g., implement existing ballast water treatment regulations). Provide information to the public about the ecological and economic damage that invasive species cause. The Alsea Estuary is large and shallow and provides overwintering habitat for migrating waterfowl and rearing habitat for coastal salmonids. The COA also has had extensive salt marsh habitat restoration and contains a lot of public lands. Beaver creek watershed is diverse and productive as habitats start at the beach and move up to the old growth forests. This area includes unique rocky intertidal habitat, important shorebird habitat, and coastal bluffs. This diverse area includes habitats ranging from coastal dunes and estuaries to mature upland conifer forests. The area connects with Columbia – Clatskanie COA and contains the entire Clatskanie River watershed. OWEB has granted Lower Columbia Watershed Council and others to reconnect Westport Slough to the Clatskanie River. The area includes Clatsop State Forest and Jewel Meadows Wildlife Area and connects with Columbia River – Blind Slough Swamp. The watershed provides critical habitat for many coastal plant and animal communities. The area contains managed forest including components of mature stands and remnant large trees and open upland grassland meadows. Encompasses Coos Bay and surrounding habitats. Includes the towns of Coos Bay and North Bend. A large (3,000+ acres) island located at River Mile 78-81 along the Lower Columbia River. The Depoe Bay COA contains the world’s smallest harbor and has a productive rocky shore and headlands for fish and wildlife use. Rock Creek which flows into Devil’s Lake is one of the most important Coho producing streams on the coast. Rock Creek mouth is a peat marsh of several acres in size. Located immediately adjacent to Tenmile Lakes COA, this area is located inland east from the town of Lakeside. Bounded by Highway 38 and the Umpqua River to the north. This area in the Tualatin Mountains (Portland’s West Hills) includes the City of Portland’s 5,172-acre Forest Park. The area is a late successional mixed deciduous and conifer forest with wetlands, flowing water and riparian habitats in the Gales Creek watershed. The 46 square mile area is conterminal with Nehalem and Salmonberry River Headwaters and Tillamook Bay and Tributaries COAs. A coastal headland with nearby steller sea lion haulouts. A large portion of the Siuslaw National Forest is included. This areas borders the western edge of the Kalmiopsis Wilderness and has unique plant communities due to the serpentine soils endemic to the Klamath Mountains ecoregion. This are contains the mouth of the Rogue River and is important habitat for Salmonids accessing the rest of the system. It has mature upland forests with a productive hardwood understory that supports a diverse assemblage of wildlife species. The Willamette River mainstem from the confluence with the Columbia River (RM 0) upstream to Willamette Falls in Oregon City (RM26), its floodplain and adjacent uplands. The Luckiamute and Little Luckiamute Rivers and tributary drainages and associated agricultural lands surrounding the Kings Valley Area and South of Falls City. Covers Mary’s Peak and surrounding wilderness area. Located north of Highway 34 and southwest of Philomath. Relatively small (15 sq mi) COA at the eastern edge of the Coast Range ecoregion, building from the Red Prairie-Mill Creek – Willamina Oaks COA in the Willamette Valley ecoregion, northwest of the town of Dallas. Necanicum is designated as a conservation estuary. The City of Seaside and the North Coast Land Conservancy have acquired a network of tidal wetlands along Neawanna Creek estuary that are designated as a natural history park. The area is a late successional mixed conifer forest with flowing water and riparian habitats in the Nestucca watershed. It is conterminal with Tillamook Bay and Tributaries COA. 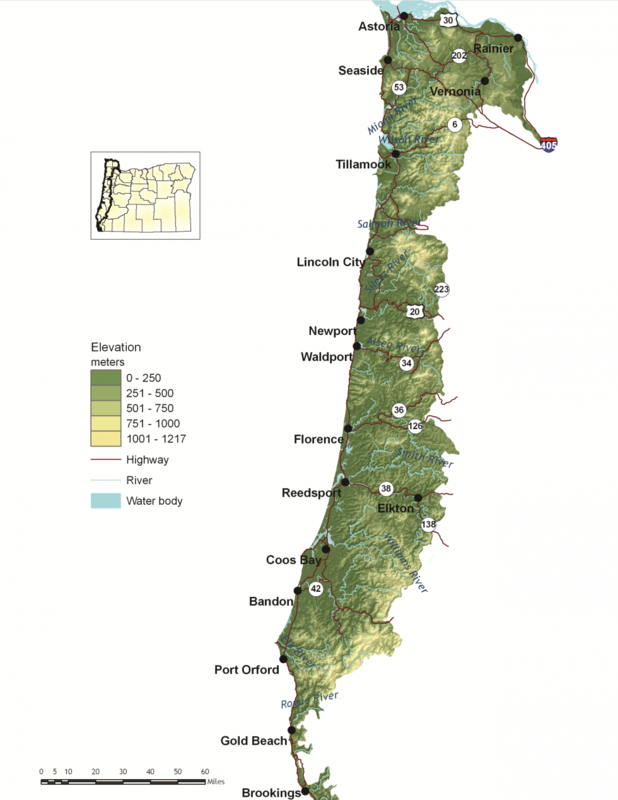 The area includes much of the watershed of the North Fork Nehalem River. A 190 square mile area of coast range mixed and late successional conifer forest, riparian areas of Nestucca River, and freshwater wetlands. Area is conterminal with Nestucca Bay and Trask Mountain COA. Located on the Oregon Coast, bounded by Cape Blanco Airport to the south and Bandon to the north. The area includes the upper Nehalem River watershed to the headwaters. The area is connected to Nehalem River Estuary Nehalem COA River Estuary. It is identified by the Oregon Plan as important for native salmonids. This area contains the Pistol River Estuary, offshore rocky habitat for nesting seabirds, and Coastal Bluffs. Area is located south of Highway 19 along Highway 22 in the foothills of the Coast Range Mountains. Includes tributaries of South Yamhill River and associated lowland habitats. Relatively small, stand-alone COA at the border of the Coast Range ecoregion with the Willamette, just west of Falls City. This area contains habitat along the mainstem of the Rogue River including portions of the Wild and Scenic area. The area contains the 3,226 acre Saddle Mountain State Park and state Natural Area, which contains the tallest mountain in Clatsop County (3,283′). Area connects with the Necanicum River watershed. Saddle Mountain is one of eight state natural areas dedicated on state managed lands. This conservation opportunity area provides a unique combination of habitat types, from the rocky shoreline inland and includes the Cascade Head Scenic Research Area. At least 3 threatened and endangered species exist here including the Oregon Silverspot butterfly. Relatively small (19 sq mi) area on the Oregon coast just north of Pacific City. This area is located north of Portland and is comprised of Sauvie Island, Multnomah Channel, the Scappoose Bay area and the eastern most slopes of Forest Park along Highway 30. Area is located in the foothills of the Coast Range Mountains and includes the Upper Tualatin-Scoggins Watershed, portions of the North Yamhill River and headwater tributaries, Mount Richmond, and the Oak Ridge / Moore’s Valley area. The Siletz estuary is a diverse and complex habitat system, occupied by numerous fish and wildlife species. This Siletz River COA is a sandstone/basalt river system with variable flashy winter river flows. The surrounding forest are primarily private owned and are actively managed for wood production. This COA stretches many miles from tidally influenced to the Willamette Valley and represents may strategy habitats. This area contains much of the Coast Range’s Oak Woodlands and is potential habitat for Western Snowy Plover. It is a key corridor for migrating birds and has high plant and animal diversity. Two large coastal lakes with floating peat islands and large numbers of wintering waterfowl exist in this COA. Carnivorous pitcher plants (Darlingtonia are found along the edges. A large bay some 6 miles long with five rivers flowing in to it. Extensive sand/mudflats provide habitat for migratory and breeding waterfowl and shorebirds. The bay is protected from the open ocean by a the Bayocean Spit, formerly used by nesting Western Snowy Plovers. This area includes Ecola State Park and surrounding 9 miles of coastline between Seaside and Cannon Beach. The area includes coastal Sitka spruce forest, eventually opening up to a grassy bluff. Sea stacks punctuate the long sweep of shoreline to the south. Offshore islands provide nesting and loafing areas for several species of seabirds. A 37 square mile area of coast range mixed and late successional conifer forest and riparian areas of North Yamhill River wetlands. Area is conterminal with Nestucca River Watershed and Scoggins Valley-Mount Richmond COAs. Follows the windy Siuslaw River and surrounding habitat. Area builds from the Siuslaw Estuary COA to the west and extends east towards Cottage Grove. A narrow river channel with a wide shallow mouth at the ocean, this COA incorporates steep coastal mountains. Area is located west of McMinnville in the foothills of the Coast Range Mountains and within the South Yamhill River Watershed. The Yaquina estuary COA is a large watershed with numerous fish, wildlife, habitat, and human resources. Ecotourism along the Oregon Coast is a rapidly growing sector of the hospitality industry. While all of Oregon’s ecoregions have excellent ecotourism opportunities, the Coast Range currently has the greatest economic activity directly linked to healthy fish and wildlife populations. The Oregon coast also enjoys some of the highest expenditures on wildlife viewing of anywhere in the state ($159 million in 2008*). Nestled against the Pacific Ocean, the Coast Range has diverse habitats that people enjoy through hiking, camping, bird watching, wildlife viewing, fishing, and hunting. Here are just a few of the Coast Range’s most popular wildlife-based recreational activities, events, and sites. When implemented carefully, with properly managed harvest levels and low-impact viewing practices, ecotourism is allowing local communities to capitalize on their natural resources in a sustainable way. These recreational opportunities, and the hospitality jobs they support, depend on healthy wildlife populations and habitats, which Oregonians can maintain and restore by working together. ODFW Wildlife Viewing Map: provides information on the best places to view wildlife throughout Oregon. Whale Watching: Twice each year, gray whales migrate along Oregon’s coast, traveling between summer feeding grounds near Alaska and winter nursery areas near Mexico. The Oregon Parks and Recreation Department’s “Whale Watching Spoken Here” helps coastal visitors spot, enjoy, and learn about the whales. During winter and spring school vacations, more than 200 trained volunteers are stationed at 24 locations along the coast. The program is popular, as volunteers made over 20,000 visitor contacts during the 2016 spring whale watching week. More information can be found at the Oregon State Parks Whale Watching Center. In addition to land-based viewing, coastal visitors can go on whale-watching boat and airplane tours offered by private charter operations (more information is available from ODFW’s Marine Resources Program). Exhibits: The Oregon Coast Aquarium and Oregon State University’s Mark O. Hatfield Marine Visitor Science Center, both located in Newport, have live animal exhibits, interactive displays, films, guided tours, and other educational programs. Tidepool Viewing: Along the rocky portion of Oregon’s coastline, tidepools harbor fascinating creatures that live in a world of shifting light, water, and salinity. Tidepool viewing is a popular activity, especially for families. Several areas provide educational programs and information on low-impact tidepooling. More information can be found at Oregon State Parks Tidepools, the Oregon Institute of Marine Biology, and the Hatfield Marine Science Center. Recreational Fishing, Clamming, and Crabbing: One of the biggest reasons people visit the coast is to go fishing or to harvest shellfish. Salmon, steelhead, Pacific halibut, surfperch, flatfish, groundfish, albacore tuna, razor clams, bay clams, and Dungeness crabs offer diverse recreational opportunities. For example, angler trips on the ocean in 2014 numbered almost 226,000, razor clamming trips to the more heavily used beaches numbered 88,000, and trips targeting Dungeness crabs and bay clams in heavily utilized estuaries numbered 51,000 and 36,500, respectively. In all, ODFW estimates that there were more than 401,000 recreational saltwater fishing, crabbing, and clamming trips made by people that year. See ODFW Saltwater Fishing for more information. Elk Viewing: During the winter months, elk often congregate in large numbers where plentiful forage is available. At ODFW’s Jewell Meadows Wildlife Area (located northwest of Portland) and Dean Creek Wildlife Area (located east of Reedsport), visitors are treated to up-close views of 120-200 elk. Paved parking lots, viewing areas, and interpretive signs help make these sites popular tourist stops. Sea Lions and Sea Lion Caves: Located along the coast (e.g., Newport waterfront, north of Florence, Strawberry Hill, and numerous other locations), sea lion viewing is a popular activity with many coastal visitors.